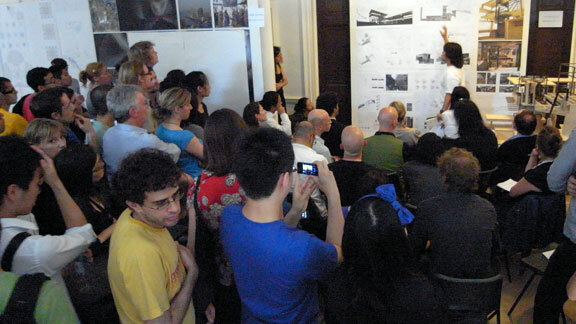 Students downstairs in the lecture hall meeting to coordinate their installation for Projects Review, the AA’s annual summer exhibition of student work. Building the exhibition.The exhibition opens this Friday evening, July 3rd. The external examiners meeting with the students and staff of Intermediate Unit 9. 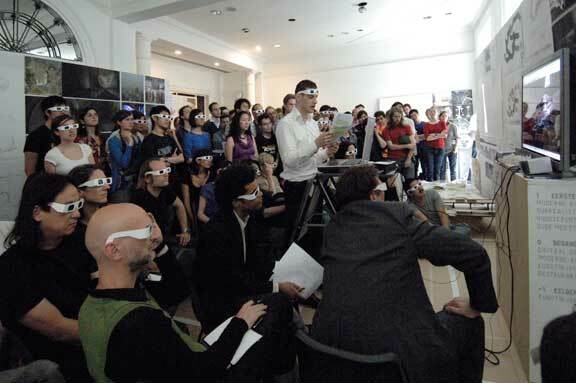 Bernard Cache (Objectile, Paris) and Hugh Whitehead (Foster+Partners, London) with the AA’s Intermediate Unit 3 Masters Ricardo de Ostos and Nanette Jackaowski. 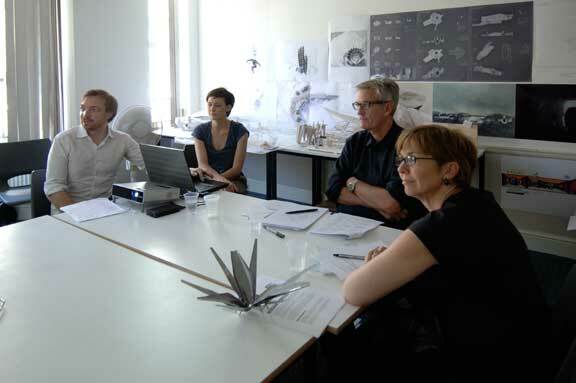 Frank Barkow (Barkow Leibinger, Berlin) and Dana Cuff (Citylab, Los Angeles) with Intermediate Unit 7’s Liam & Kate. The unit travelled to and worked on proposals for the Gallapagos Islands. 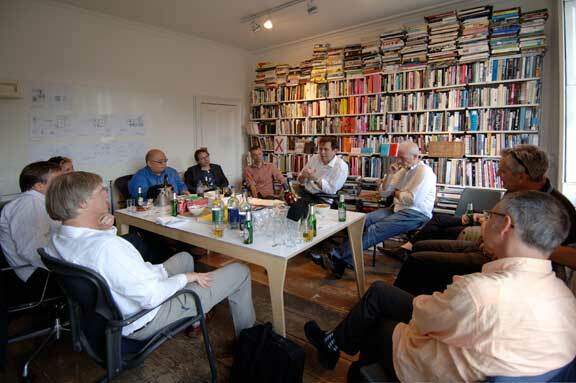 AA School Director Brett Steele and Academic Head Mike Weinstock welcome the AA’s 2009 external examiners. 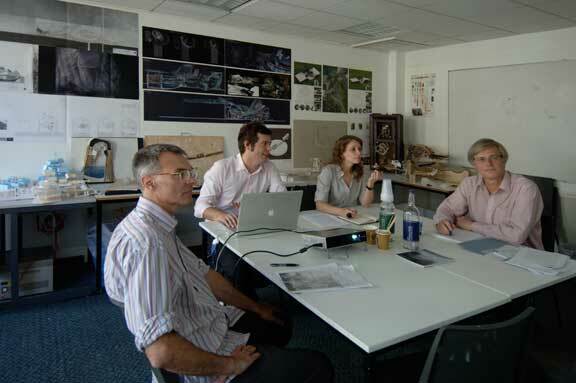 On Tuesday and Wednesday theÂ examiners will review all 3rd and 5th year portfolios, reviewing end-of-year assessments for each of the Intermediate & Diploma units. 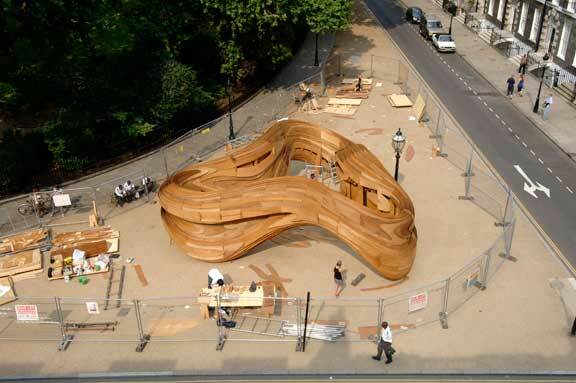 The students of Intermediate Unit 2 are nearing completion of their AA Summer Pavilion, on the Southwest corner of Bedford Square, opposite the main entrance to the school. 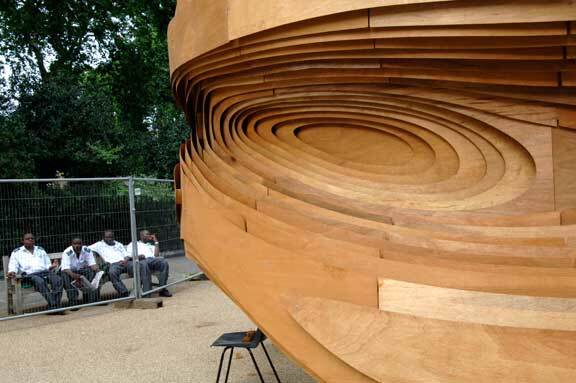 Four of Camden’s traffic wardens take a break and enjoy the AA’s summer pavilion, under construction in Bedford Square. 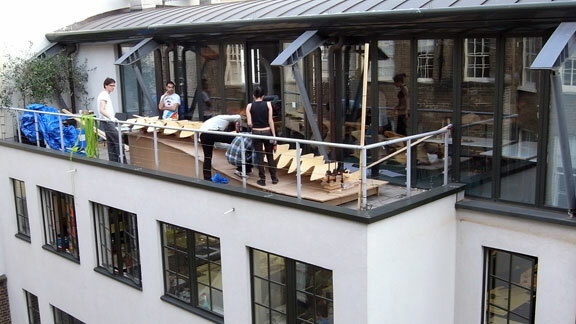 The students and staff of the Graduate School’s Emergent Technologies+Design are on the third floor of 16 Morwell street, bringing up the pieces of their new canopy for the main AA terrace. 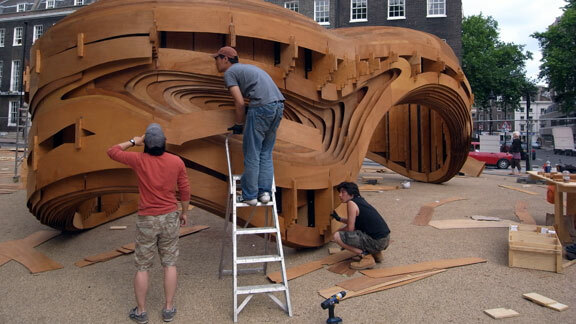 Students from the Emergent Technologes+Design course in the graduate school are assembling pieces for a big end-of-year installation on the main terrace of the AA. Another picture of this year’s tweleve nominees for the AA Diploma with Honours, taken this afternoon following their presentations to the Diploma Committee and the entire school in the AA Lecture Hall. Karl Kjelstrup-Johnson, Dip 15, presenting his project. Jumping for Joy. 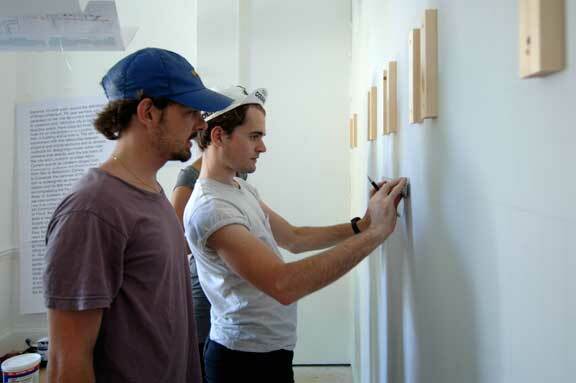 This year’s tweleve students nominated by the AA Diploma Committee for the AA Diploma with Honours. 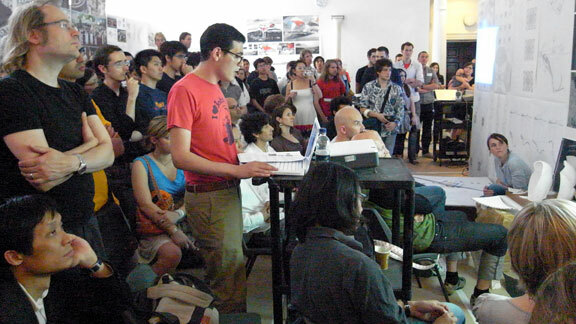 Twelve presentations were made this afternoon, by William Paul (Dipl 7), Maryam Pousti (Dipl 16), Yifan Liu (Dipl 6), Marco Ginex & Tarek Shamma (Dipl 9), Karl Kjelstrup-Johnson & Gergely Kovacs (Dipl 15), Asako Hayashi (Dipl 2), Adam Johnston & Eleftherios Ambatzi (Dipl 13), Atsushi Iwata (Dipl 11), and Edmund Fowles (Dipl 10). 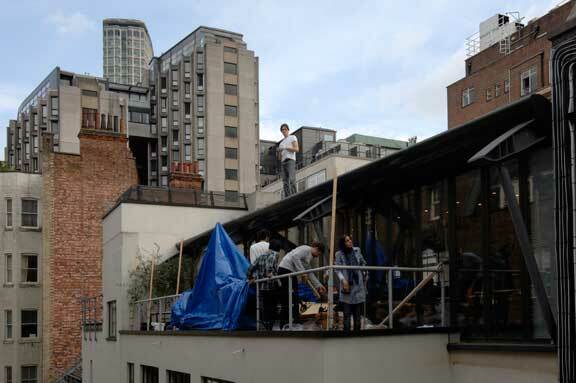 After deliberation by the AA Diploma Committee, consisting of 22 tutors in this year’s Diploma School, the AA is pleased to announce this year’s 2008/09 recipients of the AA Dipl with Honours: Tarek Shamma (AA Diploma Unit 9), Edmund Fowles (AA Diploma Unit 10), and Adam Johnston (AA Diploma Unit 13). 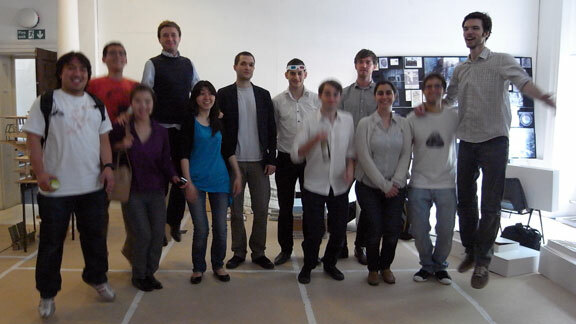 Congratulations to the winners, and all nominees, for an outstanding group of fifth-year projects. 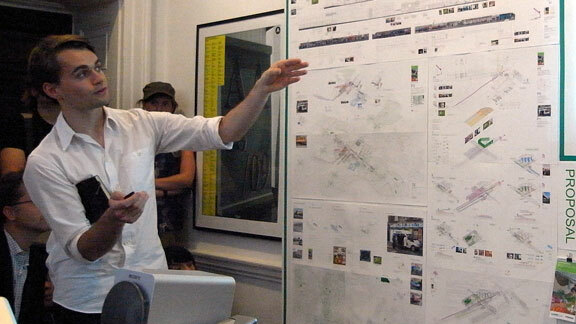 Edmund Fowles presents his Fifth Year project in AA Diploma Unit 10, the final project of this year’s AA Diploma Honours presentations, after which the Diploma Committee will make selections for awarding of the AA Diploma with Honours, for 2008/09. Tarek Shamma from AA Diploma Unit 9, presenting his fifth-year project as part of this year’s AA Diploma Honours presentations. 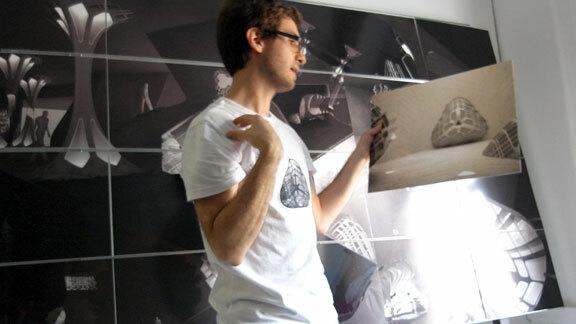 Eleftherios Ambatzis from AA Diploma Unit 13, presenting a project in print and by tee-shirt. 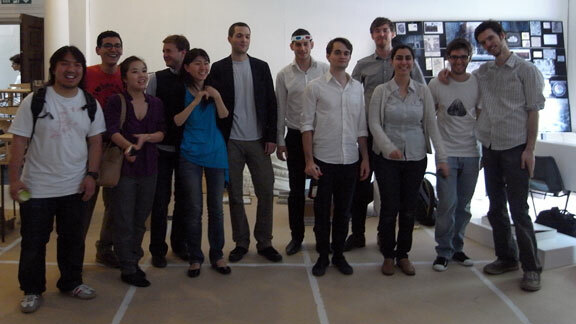 Part of the 2008/09 Diploma Honours presenations. 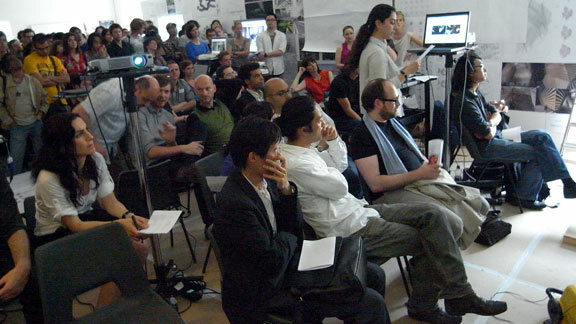 Atsushi Iwata in AA Diploma Unit 11 presents his proposal as part of this year’s AA Diploma Unit Honours nominations.